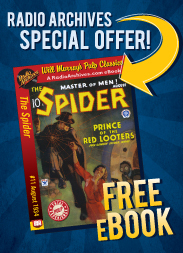 Stripped of his wealth, cut off from his faithful helpers, Richard Wentworth, known and feared throughout the Underworld as the avenging Spider, struggles with his most powerful and wily foe — the Man who came out of the East! With Wentworth's best friend, Police Commissioner Kirkpatrick framed for murder; with the entire city capitulating before that new and cruelly cunning menace from the Orient, the Spider himself seems doomed to die on the torture racks of the Far East! One man against more evil than anyone could ever imagine, enemies feared by any normal man. The Spider knew that, but it did not check the wild impulse to laughter that squeezed his lungs. It was no wonder that men call the Spider mad! Nick Santa Maria brings the action to vibrant life, narrating with a fever-pitch intensity. The Coming of the Terror originally published in The Spider magazine, September, 1936. Chapter 6: Obey — or Die!